180 – 181: Mesola, Po Delta and Lunch(es)! 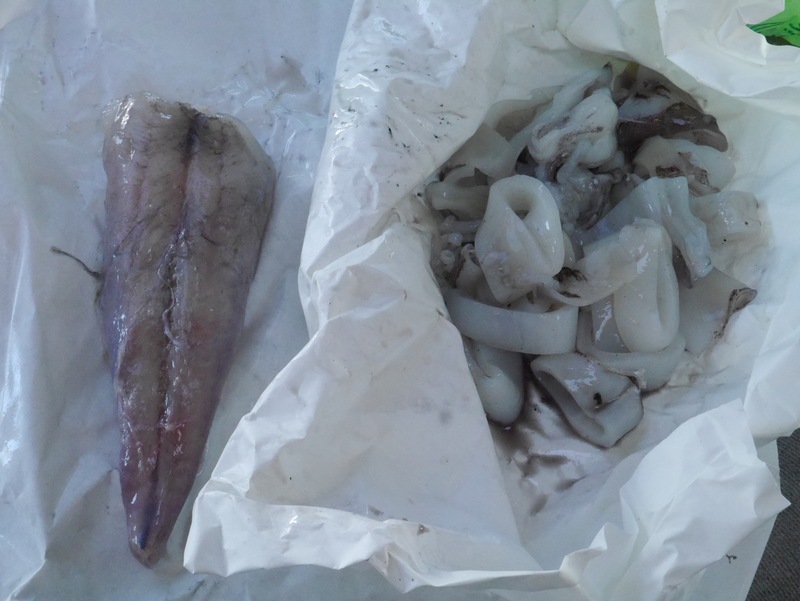 K did a speed walk to the retail fish market and came back with a monkfish tail for EUR4.50 (if you like monkfish and know what it costs at home – bargain! ), salmon and calemari. Never cooked squid … but feeling adventurous – just a little, and did not fancy the sea urchins and crustaceans on display, many of which were still waggling limbs at me! Also picked up some veggies. Total spend for really fresh produce £14 and fish and veg for soups and fish dinners for 3 days. And fun to go shopping compared to a supermarket BUT if I am going to lug shopping, I need a trolley … have a yen for one of those wheeled shoppers … if only where to keep it were not the issue! 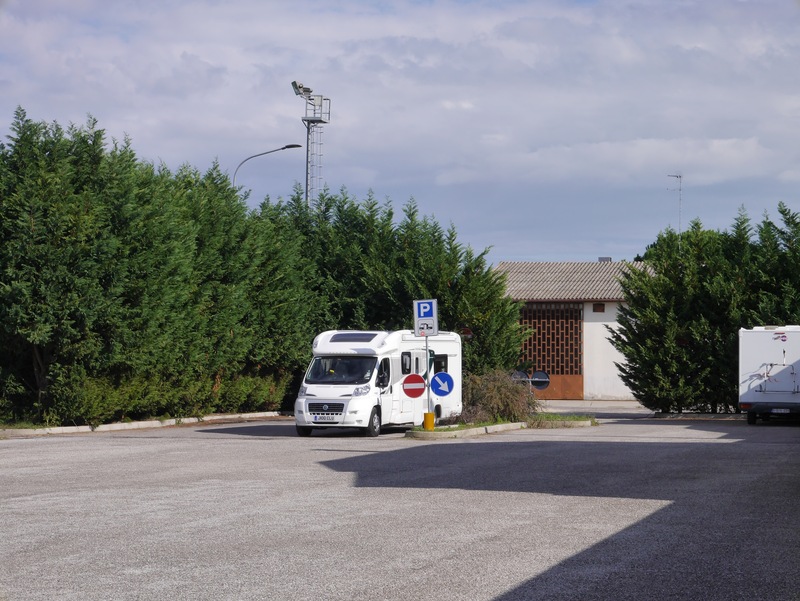 We needed LPG, diesel and motorhome services … all satisfied by the time we arrived at Mesola. No real plans to stay here, but water and waste facilities and FREE electricity. As we arrived we spoke to a Belgian couple …. a market in town. 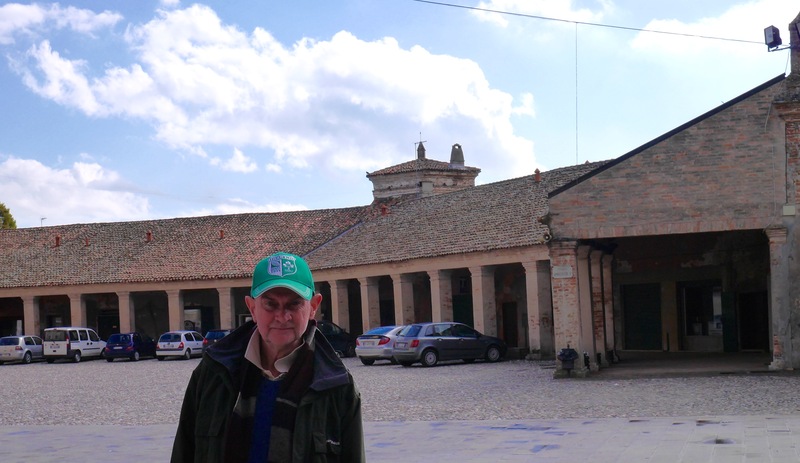 At the market we spoke to a local who recommended a restaurant …. does the fat dog slide on lino??? Really fab local food and only EUR10 for a bottle of local red. K’s mushroom, bacon and potato cake with gorgonzola and cream was AMAZING! Just one of those moments that you seize. These castle out building housed shops and our rather excellent restaurant. Later in the afternoon, we wandered back to the town, well more of a village, to see the castle. Served as a hunting lodge for Este Duchy and had numerous owners, including Popes. 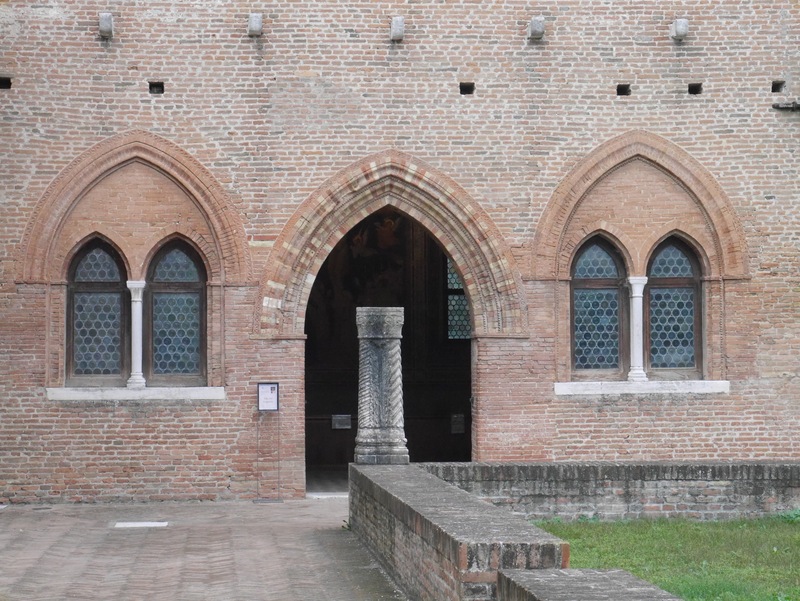 The bit of interesting history is that the Province of Ferrara (Duchy of Este) wanted to set up in competition with Venice and use the natural harbour just down the road. Venice did not care for this plan, so diverted the river Po and silted up the whole of the Po estuary. The area is now a nature reserve. The castle was not really very interesting other than it had the largest stag antlers we have ever seen. 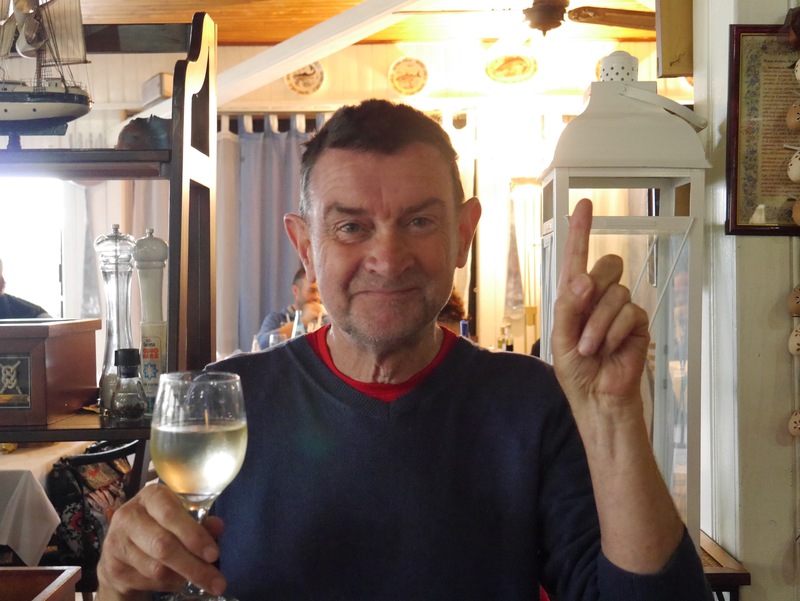 181 – Sunday 18th October 2015: Po Delta and Enforced Lunch! Being so incredibly flat here we set off planning to see all sort on the bikes. Missed a turn and rode a little further than intended. Scenery pretty similar for much of the ride … fields and waterways – not very interesting unless you are into ornithology, so few pics. One bit was through a double gated (could only open door 2 when door 1 was shut) nature reserve, and we wondered what NATURE it might contain that it had to be so carefully protected … boar, wolves??? Coffee stop at Goro. 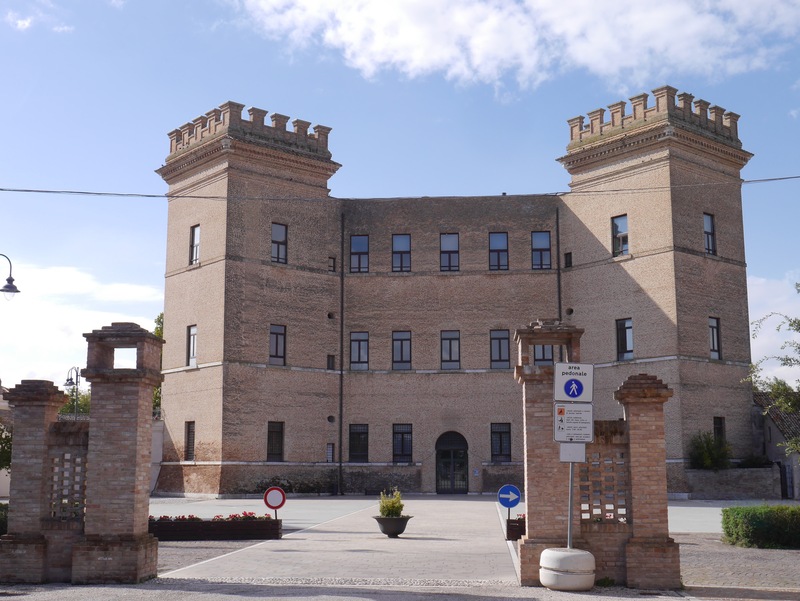 Spent a little time trying to find somewhere inexpensive for lunch at the Lido do Volano … the one Michelin Star Fish restaurant was rather pricey!! Had to have lunch out as we had run out of bread for J’s sarneys and K, running around the town in the morning, had not been able to find a baker / shop open. Lovely cheese ravioli in a salmon cream, washed down with a half litre carafe …. the wine was only EUR4!!! The beach at Lido di Voltano … a row of fishermen and the Adriatic around here is dead flat. The Lido is a rather shabby resort, not helped by the grey weather, but still a hot spot for the Italians … there were about 20 motorhomes all parked up. Thank you again Stephen for the rugby score updates … do we HAVE TO support France now? J says Argentina counts as more European! 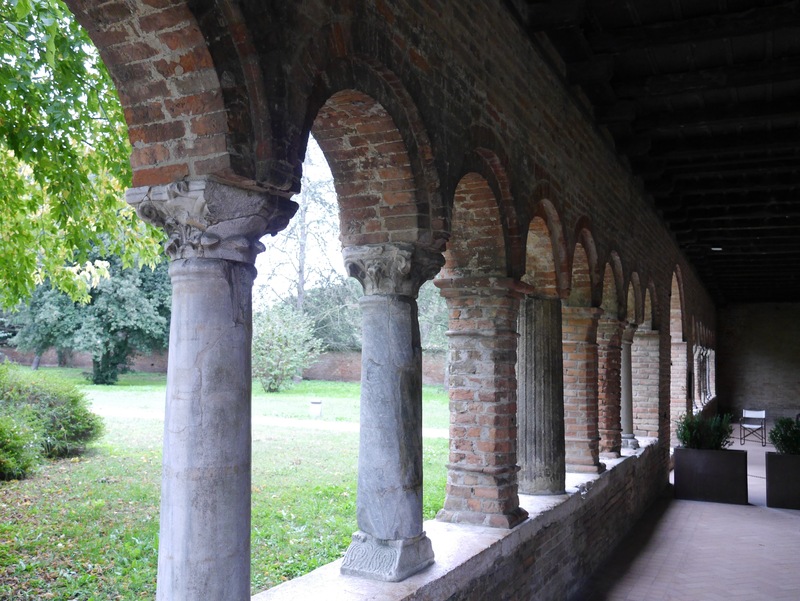 Continued our bike ride to the Abbazia di Pomposa: really old monastery, again with frescos. Claim to fame, it that they ‘welcomed’ (whatever welcomed means – did they just say hi and send him on his way again?!) the monk who created the musical 7 note score. Strange how the Campanile increases the number of windows as it goes up. A less interesting ride back on the main road in the rain. 33 miles completed. We are seeing a lot of semi derelict buildings on our Italian journey. Heating on and see no reason to move from our free pitch. 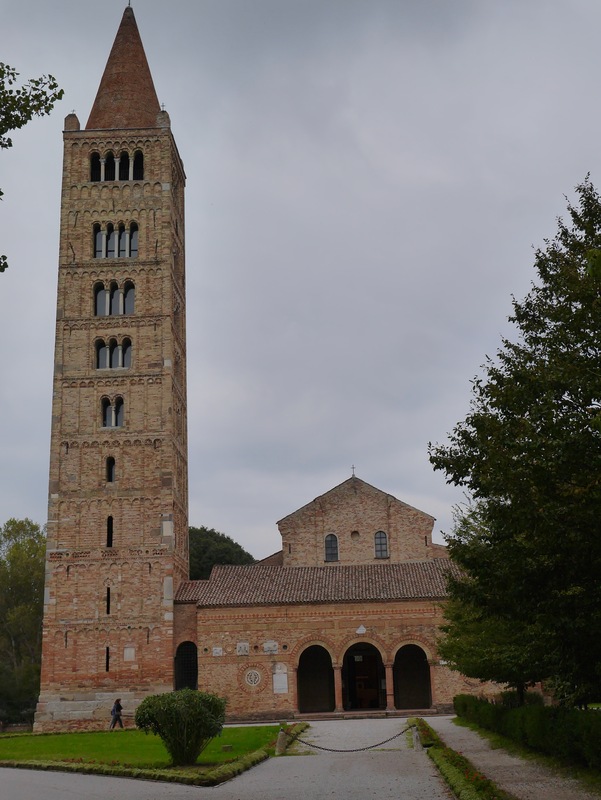 This entry was posted in Italy, Tour 2015-16, Tours and tagged 2015, Abbazia di Pomposa:, abbey di Pomposa, dukes of Este, Goro, Italy, Lido di Voltano, mesola, motorhome, motorhoming fulltime, po delta by Clunegapyears. Bookmark the permalink. Mmmmmmm. I guess I really missed out on the fish. Didn’t miss Pomposa tho. Thought it would be shut for sure as Mon Lunch but actually got in for free. Even better mosaics to be found in Ravenna. 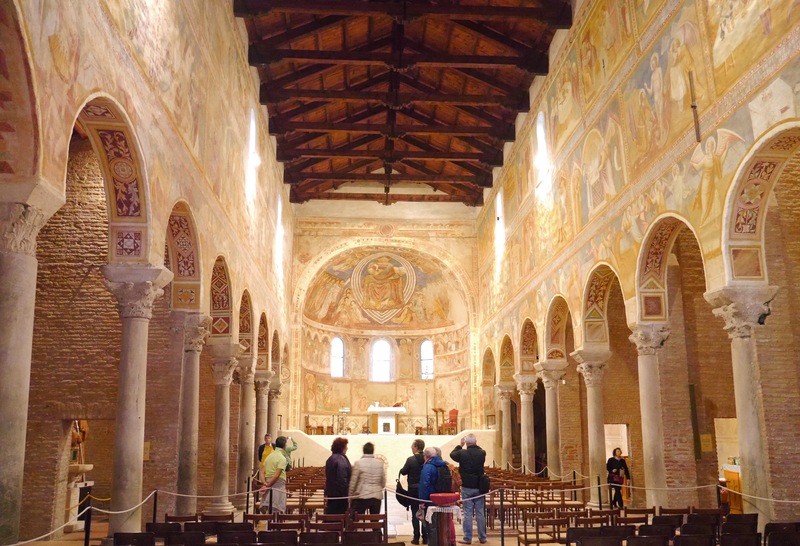 Yes, we stopped at Ravenna too – best mosaics we ever seen. Where are you now? We are in Rimini tonight again as James has a dental appointment tomorrow at the hospital here. Hoping to make Assisi tomorrow night.